Pakistan's flush-out operation in South Waziristan Agency is in full swing. Tahir Ali unravels the rigamarole behind what Pakistan calls the mother of all operations. Calling it the "mother of all operations", Pakistan has started a massive offensive against militants in the restive South Waziristan Agency (SWA). Named operation Rah-e-Najaat (The Path to Salvation), the initiative started last Saturday -- plans to flush out Hakimullah Mehsud led Tehrik Taliban Pakistan (TTP). The dreaded outfit, on its part, has claimed that it will fight "till the last drop of their blood". Intense fighting has been reported from the area where army jets and artillery are pounding military hideouts in the Mehsud despite both sides claiming that they are inflicting heavy losses on the other. Army says at least 80 extremists were killed and 30 hideouts destroyed. Stressing that Taliban achieved many targets, its spokesperson Azam Tariq claimed the outfit would fight "till the last drop of their blood". Not only Pakistan, but the rest of the world is looking forward to the result as Waziristan is said to be the nursery of jihad. SWA is broadly divided into two parts -- Mehsud and Wazir. Mehsud is the main tribe comprising 60 percent of the population that live in Sarokai, Kaniguram, Makin, Shakatoi and Sararogha. After the death of Baitullah Mehsud, Hakimullah Mehsud is leading militancy in Mehsud, while Mullah Nazir is in charge of Waziri. Armed with three divisions of troops, the army is pounding militants with a three-fold attack. Seven-Div is attacking from Mirnashah side, the headquarters of North Waziristan Agency (NWA); Nine-Div is attacking from Wana while Fourteen-Div is making its way from Dera Ismail Khan's side. The attacks have resulted in mass exodus. 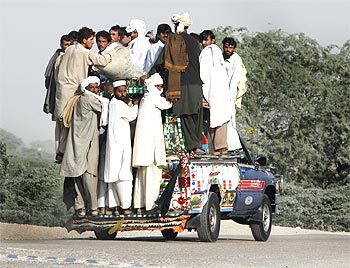 At least 190, 000 tribesmen have left the area for safer places in the nearby NWA, Bannu, Lakki Marwat, Dera Ismail Khan and Tank districts while around 340,000 are still in their villages. Information minister Qamar Zaman Kaira said, "So far 14,500 families have been registered and the government is taking care of the displaced persons of South Waziristan". According to Dastageer Betani, a student leader in the nearby Tank area, "Those who could afford to rent houses in safer areas have left. Those who can't afford are in no mood to leave; they prefer being killed in their homes to living miserably in tents or makeshift school buildings." In July, this year, the government successfully carried out another operation Rah e Rast (Straight Path) against Maulana Fazlullah-led Taliban in Swat, which encouraged it to make an assault against TTP in South Waziristan. According to Maulana Azizur Rehman, a veteran fighter from North Waziristan, "Rah e Najaat does not seem an easy one, as in Swat, where the militants were inexperienced and there was no support from locals. 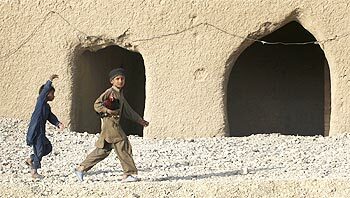 Also, Maulana Fazlullah's men started fighting the military without the permission of Waziri militants." Image: Men fleeing the offensive in South Waziristan being checked by police. He said that Waziristanis hardly leave their homes during war times, only they take their children and women to safer places and then return to fight. "In Swat, mostly ordinary people joined Taliban while the real militants that could fight Pakistani Army were few in numbers and it was the main reason for Taliban's defeat in the area. Comparatively, Waziri militants are very experienced especially in guerilla warfare that could not be defeated like Swati Taliban", the Maulana added. Hakimullah is leading the fighters with commanders like Waliur Rehman, Qari Hussain, Commander Azmatullah Mehsud, Punjabi Taliban and above all some 1,500 "foreign fighters". He has ordered the Punjabi Taliban to go all out and attack the government installations. To make the operation successful, the Pakistan government is trying to get the support of some "good Taliban" like Mullah Nazir in the region. Also the state agencies are trying to ignite the decade-old rivalries between the two tribes, Wazir and Mehsud that remained at loggerheads with each other in the past. In the 70s, the Waziri Ulema issued 'fatwa' and declared 'jihad' against the Mehsud; the decree resulted in tussles between the two tribes in which a number of tribesmen lost their lives. In Wana bazaar some Mehsud tribesmen, who do business, were brutally killed. All routes to Waziri areas pass through Mehsud territory, so Waziri tribesmen remained cut off from the rest of the world for a long time. In 2007, when Mullah Nazir ousted Uzbeks militants and their hosts Commander Haji Omer from Wazir territory, they were warmly welcomed by then TTP head. When in the same year Baitullah Mehsud formed TTP, Mullah Nazir refused to join. Ideologically almost all Taliban, whether they are of Waziri background or Mehsud, follow the Deobandi school of thought. When the drone attacks increased in the Federally Administered Tribal Areas (FATA) for the first time Mullah Nazir, Hafiz Gul Bahadur Wazir and Baitullah Mehsud met in February this year and formed Shura Ittehad-ul-Mujahideen (SIM) and decided that jihad would continue and all factions would help each other if any of them was attacked by the Pakistani army. According to Muhammad Rasool Dawar, a journalist, "Mullah Nazir joined the SIM just to pressurise the government not to support drone attacks in Waziristan. He had differences with TTP and is of the view that the Pakistani Taliban should fight against the 'far enemy' (NATO forces in Afghanistan) while TTP focuses on the near enemy (Pakistani Army)." At the moment Nazir, who belongs to Zalikhel sub-tribe, has complete control over Wana and its surroundings. He has appointed different commanders to take care of their own constituencies while he is relying mostly on Commander Shamsuallah of his own tribe Zalikhel. Qari Haleemullah represents Tujikhel sub-tribe, Commander Amir Hamza leads Gangikhel Wazir, Ghazi Muhammad leads Khojalkhel Wazirs and Commander Tehseel is the head of Taliban at Skai area. Since 2007 Mullah Nazir is in an agreement with the government that his men would not attack Pakistani security forces while his fighters would not be disturbed while crossing over to Afghanistan for 'holy war'. Sources in Wana told rediff.com, "Twenty days ago, General Sajjad came to Wana from Peshawar and reviewed the said agreement with Mullah Nazir." Image: Another picture from the restive area. It is a tough time for Mullah Nazir, now, whether to follow SIM and help Hakimullah Mehsud or to show loyalty to the Pakistani government. He is under tremendous pressure from his fellow Taliban who ask him to support TTP in this critical hour, if he does not do so there might be a revolt and Haji Omer, currently living in exile in the Mehsud area, could come and remove him from his position. According to Ashfaq Wazir, a militant in the Shamsuddin group, who was reached by telephone, "We have told Mullah Nazir to support Mehsud mujahedeen in this battle, as it is vital for our own survival. For a while we would be in peace but if the Taliban were defeated in the Mehsud area, next would be our turn." Hafiz Gul Bahadur has already broken his peace agreement with Pakistani Army in North Waziristan that was signed in February 2008. Though at the moment his men are not openly attacking the security forces they still support Hakimullah Mehsud. His commanders Sadiq Noor of Khatay Kali, Maulana Azizur Rehman and Commander Aftab of Mirali have vowed to support Hakimullah Mehsud in the "decisive battle" against the army. Taliban from North Waziristan are attacking the army in Razmak area which is making its way towards Makeen and Ladha, Mehsud's stronghold in South Waziristan. History reveals that Pakistani Army has never succeeded in operations against militants in FATA, like in North Waziristan, South Waziristan, Orakzai, Bajaur and Mehmand agencies. After such operations, usually the government lost its control over the area and later signed peace agreements with Taliban. But, Operation Rah e Najaat is said to be different from all other operations that the Army carried out in the past. If the government succeeds against Hakimullah Mehsud, it could be the end of Taliban in the region; in case the government is defeated ,Taliban would emerge as invincible.